A great read full of interesting and well rounded characters. I’m not normally a paranormal reader. Or indeed a romance reader. But this was a compelling read in a thoroughly believable hidden world with interesting and attractive male protagonists. I look forward to more from this author. Wow! I have found a new author to read! Leisl Leighton has created a world full of intrigue and captivating characters that draw you into the story and hold readers hostage until the very end. I was certainly spellbound throughout. A promising start to the Pack Bound series. Pack Bound was an engaging read with great characters and I look forward to reading what the author has in store for me next. I would recommend this book to other readers. I was hooked! I love all the characters, not just the main ones. I hate the bad guys and am [very] intrigued by the plot line. I read nonstop because I had to know what exactly happened in her past. The further along I get in this story, the more I love it! Love this book! Awesome world the author has created and I love her writing style. Looking forward to the story continuing in book 2. Really enjoyed Leighton’s novel Pack Bound. I love stories where the heroine isn’t aware of her powers and has to learn what she can do. Great start to a series. This world is exciting for me because it is set in Australia, and it is interesting that Witches and Weres are bound together to survive. I found the premise very cool…I recommend to all shifter and witch fans because this is an intriguing story with tons going on and a new spin that you will love! I can’t wait for the next book! 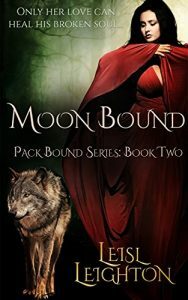 I have to say that the Pack Bound series is off to a great start, the first book Pack Bound was an exciting read and now Moon Bound is one thrilling read that had me glued to the pages…The Pack Bound world is definitely fascinating and full of intrigue which ensures that I am going to keep coming back for more. The continuing saga of the Pack Bound series, Moon Bound bring us Wiccan Healer-Witch Bronwyn Kincaid and Wolf, River Collins. This is a great addition to the series with a fabulous storyline and engaging character I found myself glued intently throughout. I will be recommending this book and series to readers and look forward to reading more. I’m absolutely looking forward to the next book in this wonderful series. I really enjoyed this story, and can’t wait to read the next story to see what happens next!…I recommend this unique Were-world to any paranormal fan who love shifters and magic mixed with mate love! I wonder who’s story is next!! Book 3 in the Pack Bound series, Shifter Bound continues the battle for survival. With intrigue, conviction and strength there is nothing they won’t do to destroy the darkness. If you haven’t read this series, you should. Leisl Leighton is an awesome story teller. This whole series so far has me wanting to keep finding out more about other characters and read her other books. The intriguing Pack Bound saga continues in another thrilling romance that keeps readers on the edge of their seat… I was completely caught up in the suspense of the story as well as this emotionally turbulent romance where both the hero and heroine seem to think that neither has a chance at a ‘happily ever after’. This series continues to enthral me and their enemy continues to incite some very strong emotions from me as well, so needless to say I can’t wait to find out what happens in Wolf Bound. The Pack Bound series continues with book 3 Shifter Bound and is an intriguing and somewhat additive read that keeps its followers coming back for more. I liked the characters and the overall storyline and look forward to reading more from Ms Leighton. This is book 3 in the Pack Bound series. It’s Eloise and Iain’s story. Cain and Morrigan are back creating havoc with the pack intent on stealing Eloise power. As the bond tightens between Iain and Eloise to fight the evil several in the pack must sacrifice to save the good. Great continuation of the storyline. You will so get pulled in to the story and right along with the characters as you read. Eloise has come to love the pack that she was sent to spy on and the Were, Iain the Lone Wolf. She will have to choose as she finds out about her true self and powers she has. I so can’t wait to read more of Leisl’s work. Leisl has out done herself again with this book. Strong characters and a great story line that will keep you entertained while reading this book. I so couldn’t put it down once I started reading it either and neither will you. I can’t wait to read more of her work either too. I have come to love this series. Wolf Bound is the thrilling conclusion to the Pack Bound series by Leisl Leighton. An action packed, edge of your seat, amazing read that held my intrigue from the beginning. I have enjoyed this series from the first book and Wolf Bound is a well written engaging conclusion. I would highly recommend this book and series to reader I am sure you will love it as much as I have. I look forward to reading more by this author. The conclusion to the Pack Bound series is a thrilling read that kept me on pins and needles throughout the book. All the characters in this four book series are strong, compelling and easily draw readers in their story but I have to say that Shelley and Adam captured my attention from the beginning and Wolf Bound which finally tells their story certainly brings them to full and vivid life… Shelley and Adam’s part in this battle has readers biting their nails during the entire story…The final outcome was one that is spectacular, exciting and very fitting for this series and there was no way that I could put this story down until I had read every last word. This was definitely a thrilling, action-packed and edge of your seat read, that I’m sure will be well received by those who have followed this series from its conception. Fabulous characters play vital roles and draw readers in with their strong and compelling natures. With a war waging, the suspense is ever present and the anticipation of the final outcome keeps you riveted to the very last page. I’m positive readers will be totally enthralled by this final chapter in the ongoing battle between good and evil and the underlying hope for peace and a better future. An exciting climax with the right amount of danger, chaos, and romance; that’s what you get with this captivating story. Enjoyed it and the author keeps you going. It doesn’t stagnate and slow. It was great!!! A good exciting finale and the final chapters will keep you enthralled. Buy all 4 novels now and get into this remarkable new series.